A couple of times a year a local non profit glass studio holds an introductory flame making and glass blowing workshop event (usually pumpkins in October and ball ornaments in December) in addition to their full on hot shop, stained glass, bead making, and glass fusing classes (I check Groupon for discounted glass blowing classes too. It is an expensive hobby!) I signed up for their mailing list ages ago but just haven’t been able to make it fit into my schedule until now. 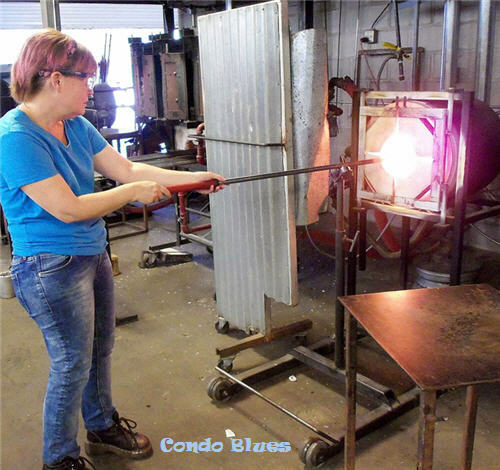 I wasn’t sure if I’d be standing around and watching the instructor blow glass or if I’d get to do some, any, or all of it because when I got there all of the people in front of the glass furnaces seemed to know what they were doing. 2. I don’t want to burn my eyebrows off. My husband helpfully reminded me not to burn myself to a crisp before I left the house. Isn’t he sweet? Turns out I’m surprised I got to do as much glass blowing as I did. I had an instructor with me every step of the way. She handled the hard parts like preparing the glowing glob of glass on the blow pipe, shaping, and making the pumpkin stem. Fist I learned how to turn and heat the glass in the glass furnace until it was ready to add color to my soon to be pumpkin. I felt like a total Tough Gal working with lava AND I didn't burn my face off! Go me! 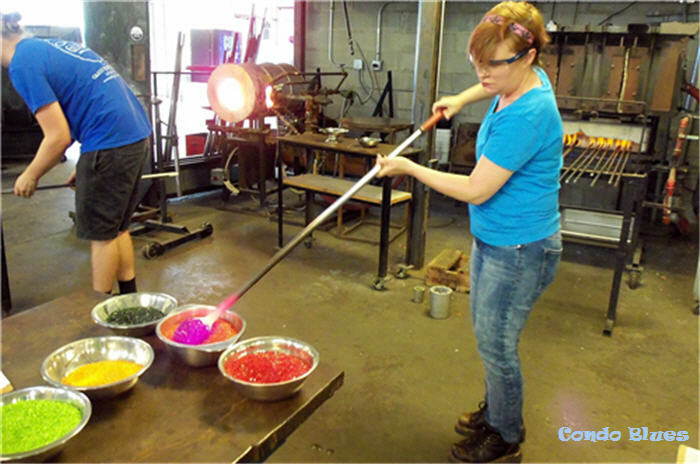 Next I learned how to add color by rolling the molten clear glass blog into a stainless steel bowl of red colored glass chips. They use stainless steel tools because it is a poor conductor of heat. After covering my blob in red colored chips I put it back into the furnace and slowly turned it to melt the colorant into the clear glass. I repeated the process to add a second color of orange to make a classic colored pumpkin. The following steps have to be completely quickly or the glass will cool too much to be shaped. That’s why I don’t have a lot of pictures of the process and the photos I do have are a little burry. Sorry. After I rolled the glass pipe in the furnace to completely melt the color chips into the clear glass, I handed it off to my instructor. 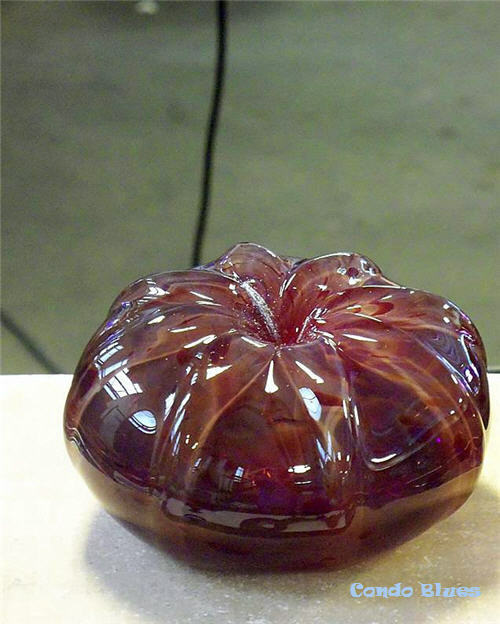 She put the glass is put into a pumpkin ridge mold to forms the ridges of the fruit. It is too small to be called a pumpkin just yet. We use this concrete glass mold to shape the ridges of the pumpkin. We need to blow this glass blob up to make a pumpkin! We’re now at the blowing part in the glass blowing process. My instructor rolled the glass pipe back and forth while I held a wood shaping tool to our ridged glass blob to further work it into a round shape and later blew through the blow pipe to inflate the glass pumpkin just like blowing up a balloon. I’m surprised it didn’t take much to blow the glass into the size I wanted. We repeated this process until we were satisfied with the size and shape of our starting to look like a pumpkin. 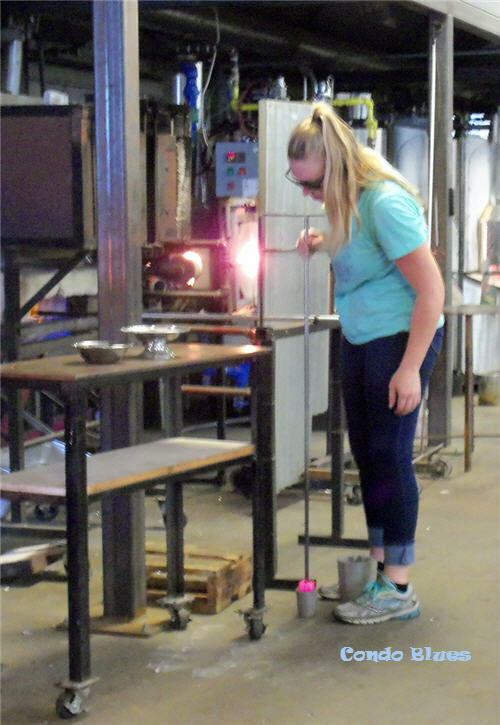 The final step for this piece was my instructor removing the blown glass from the blow pipe. It’s starting to look like a real pumpkin! The color will change as the hot glass cools. Lastly my instructor handled the hard part of coloring, forming, and attaching a green glass pumpkin stem. 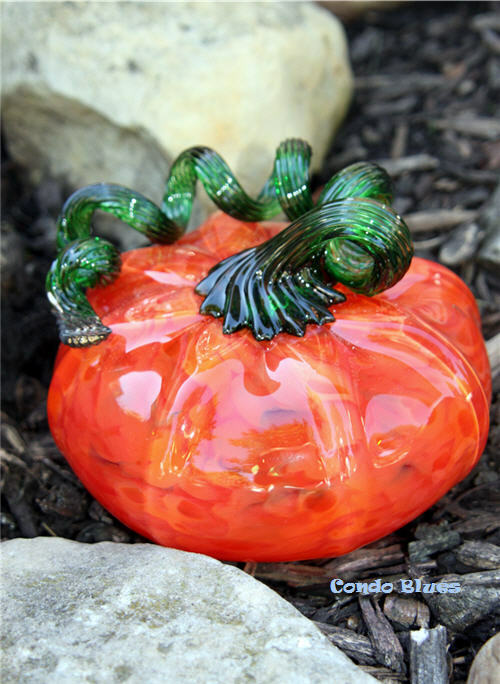 The final step was to allow the glass pumpkin to cool slowly in an annealing kiln otherwise the glass might crack or shatter due to small temperature flux's during its (probably short if not annealed) life. Pin this post for later and to share it with your friends on Pinterest! Waiting three days to pick up my handmade glass pumpkin was the hardest part of the process!